Are you finding all the mutations in your genomic sequence data? CytoGnomix® Inc., a genomics company, has released this web service to help researchers quickly examine millions of DNA variants simultaneously. This world-class software currently interprets mutations that affect transcription, mRNA splicing and protein coding, and stores the results in a database that can be compared to other sources of genome variation. MutationForecaster® brings together a suite of tools that we've created in a single easy to navigate interface. Our products can find and validate mutations that others cannot. Genome-scale mutation analysis to predict variants affecting gene expression (mRNA splicing and transcription). Built in filtering tools aid you in determining a short list of variants most suitable for further examination in the laboratory. 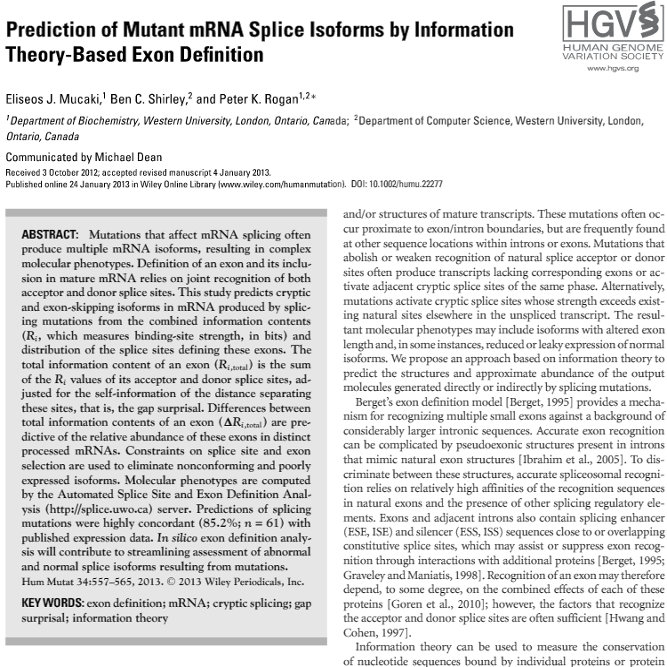 The Automated Splice Site and Exon Definition Analyses (ASSEDA) tool examines the consequences of a single variant on mRNA splicing in detail. Potential isoform structures are displayed along with their predicted relative abundance. 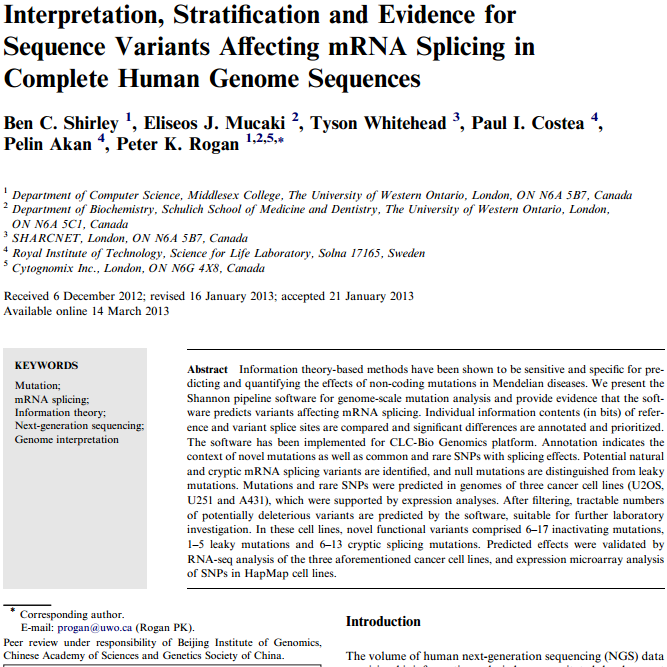 Compare genome-scale splicing variants with RNA-Seq data. Reads produced by splicing mutations are compared in disease and control samples to compute p-values. Variant Effect Predictor (VEP) predicts the effects of your variants on genes and protein sequence. SIFT and PolyPhen scores are also generated. The Cytognomix user variation database (CUVD) stores your variants generated by any of our web tools at the click of a button. 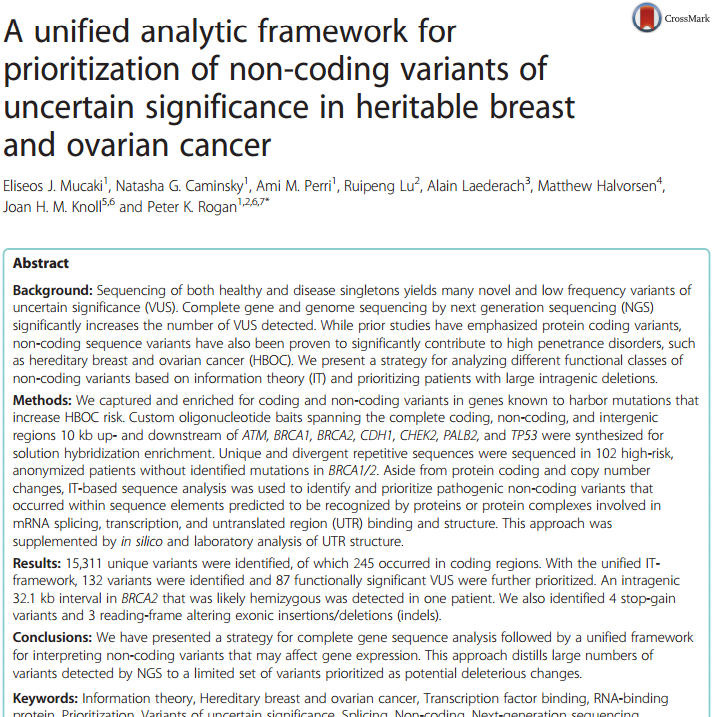 Variants can be directly related to public data in HGNC, NCBI, EBI, ClinVar, as well as locus specific LOVDs. External databases can be searched with batches of variants. A cytogenomics visual analytics decision support tool to find medical literature that relates genes to phenotypes. Used to filter disease relevant mutations from other MutationForecaster® tools. The information-theory based methods utilized by our proprietary software are presented in peer-reviewed publications. These articles include novel, deleterious non-coding variants discovered by ASSEDA and the Shannon Human Splicing pipeline. Visit the learn more page for a brief description of each tool alongside related publications, presentations, videos, and documentation. Additional tutorial videos discussing general MutationForecaster® operation and the usage of each tool can be found on the video tutorials page. CytoGnomix now offers a bespoke variant interpretation service which allows customers to simply supply a list of genomic variants and receive a prioritized list of variants with potentially deleterious non-coding effects. Your variants will be examined by a team of experts using a unified, information theory-based method only available from CytoGnomix. We regularly publish novel variants discovered using our systems (ASSEDA, Shannon pipeline, Veridical) and peer-reviewed articles detailing recent advancements in our methods. In our experience, we will find variants with potential non-coding effects in any reasonably sized dataset. Non-coding variants we can identify include those that affect mRNA splicing (abolishing, leaky, cryptic site activation), transcription factor binding, RNA binding protein recognition, and splicing regulatory elements. Submit a Variant Call Format (VCF) file to us containing the genomic variants to be assessed. A small number of variants may be sent in any HGVS-approved variant nomenclature if only ASSEDA analysis is requested. We will analyze your variants using tools available only through CytoGnomix. The analysis type chosen upon variant submission determines what tools are executed and what filtering techniques are utilized. A prioritized list of variants is returned to you. Variant categories are identified, ranging from "Probably Deleterious" to "Likely Benign" based on their predicted non-coding effects. 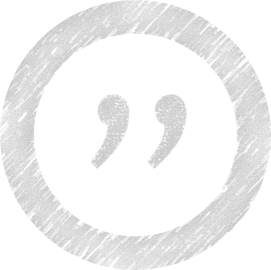 Visit our testimonials page to see all user comments. The tools on MutationForecaster® are frequently updated and user feedback is a critical component of our decision-making process when implementing new features. If you decide to purchase a MutationForecaster® subscription, we are happy to provide assistance in both software usage and result interpretation. I used the MutationForecaster system to predict the effects of intron​ic​ variants in NTRK1, The results are ​precise. For example, the variant NM_002529.3:c.851-33T>A was predicted to affect lariat formation in mRNA splicing, which has been verified by our laboratory. It ​was a bit difficult for me to interpret the results, but your company staff provided me with good support. Thank you! The analytic tool [Shannon Human Splicing pipeline] is being applied to evaluate a variety of variants which can be difficult to interpret in terms of their effects on protein function. Analysis of variants for potential effects on splicing provides a tool to distinguish deleterious mutations from passenger variants and generates hypotheses that can be experimentally evaluated using PCR of reverse-transcribed tumor RNA. This outstanding tool [Veridical] appears very useful to screen the wealth of transcriptomic data for effects in splicing due to mutations in disease samples, and I think that it will potentially be of interest for many if not all such RNAseq-based studies. In addition, this could spur further efforts to derive similar tools with improved efficiencies. 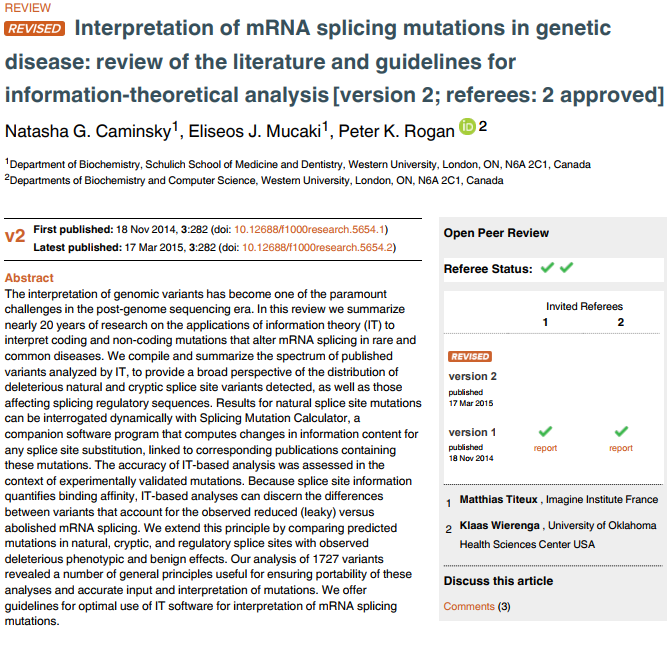 Use of this method should help establish the importance of aberrant splicing in disease as well as the effects of genomic mutations at the RNA level. Cytognomix's Shannon pipeline is resolving significant data interpretation issues in cancer research. MutationForecaster® is used for biomedical research. This software should not be relied upon for clinical diagnosis, prognosis, or therapy. It has not been approved by any regulatory agencies for this purpose. MutationForecaster® uses patented and patent pending technologies. See CytoGnomix.com for details.